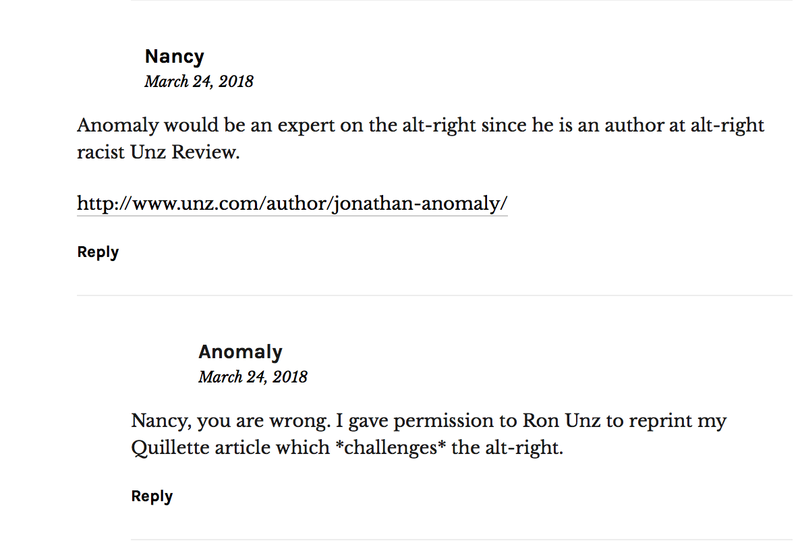 I was frankly surprised that I was permitted to comment in the first place on an article by Jonny Anomaly (I'm still not sure if that's a real name or a punk rock name), a some time co-author of evo-psycho bros Brian Boutwell and Bo Winegard in Quillette. So it was no surprise to eventually find that the interchange I had with him in the comments section of his piece in Quillette What the Alt-Right and Regressive Left Have in Common was suddenly disappeared and the comments section closed. No surprise at all from the alt-right gang at Quillette who like to pose as champions of free speech and enthusiasts of lively exchange. They are precious snowflakes who absolutely cannot tolerate criticism. Ben Winegard, David Geary, and I wrote a comment on a Behavioral and Brain Sciences’ article about political bias in 2015, in which we forwarded what we termed the “paranoid egalitarian meliorist” (PEM) model of progressive bias. I’ve come to believe that the name is inevitably and uncharitably pejorative (“paranoid” sounds bad even though it is descriptively neutral), so my colleagues and I have renamed it equalitarianism; however, I still think the basic model is accurate. Putnam had so much in common with the 21st century hereditarians. The Citizens' Councils (also referred to as White Citizens' Councils) were an associated network of white supremacist, extreme right, organizations in the United States, concentrated in the South. The first was formed on July 11, 1954. After 1956, it was known as the Citizens' Councils of America. With about 60,000 members across the United States, mostly in the South, the groups were founded primarily to oppose racial integration of schools, but they also opposed voter registration efforts and integration of public facilities during the 1950s and 1960s. Members used severe intimidation tactics including economic boycotts, firing people from jobs, propaganda, and violence against citizens and civil-rights activists. By the 1970s, following passage of federal civil rights legislation in the mid-1960s and enforcement of constitutional rights by the federal government, the influence of the Councils had waned considerably yet remained an institutional basis for the majority of white residents in Mississippi. The successor organization to the White Citizens' Councils is the St. Louis-based Council of Conservative Citizens, founded in 1985 to continue collaborations between Ku Klux Klan and white supremacist political agendas in the United States. Republican politician and past Senate Majority Leader Trent Lott of Mississippi was a member while North Carolina Senator Jesse Helms and Georgia Congressman Bob Barr were both strong supporters of the Council of Conservative Citizens; David Duke also spoke at a fund raising event, while Patrick Buchanan's campaign manager was linked to both Duke and the Council. In 1996, a Charleston, SC, drive-by shooting by Klan members of three African American males occurred after a Council rally; Dylann Roof, the perpetrator responsible for the murder of nine Emanuel AME church members in Charleston in 2015, espoused Council of Conservative Citizens rhetoric in a manifesto. Many of the modern proponents of hereditarianism and opponents of "equalitarianism" come from Southern states and work for colleges in the South. Bo Winegard seems to be practicing a slightly updated form of old-time Southern white racism. Carleton Putnam (December 19, 1901 – March 5, 1998) was an American businessman, biographer, writer, and segregationist. He graduated from Princeton University in 1924 and received a Bachelor of Laws (LL.B.) from Columbia Law School in 1932. He founded Chicago & Southern Airlines in 1933, which in 1953 was merged with Delta Air Lines. He would later serve as chief executive officer of Delta Air Lines and hold a seat on its board of directors until his death. Here we see that Henry E. Garrett published "The Equalitarian Dogma" in the pages of Mankind Quarterly, the ultra-racist publication supported by The Pioneer Fund, which also financially supported many of the scientific racialists whose work was used in creating The Bell Curve. I've written about Mankind Quarterly in this series before. The article points to IQ testing as the justification of innate black inferiority and rages against communism - just as the hereditarians at Quillette do. The Mankind Quarterly archives are provided via The Unz Review - not for some historical edification but because Unz Review is a racist web site and seeks to preserve the views of Mankind Quarterly, which also published work by Richard Lynn, an important source for The Bell Curve. Before my comments were censored by Quillette, the first of my exchanges with Anomaly was captured in the Wayback Machine. In it I point out the connection between Anomaly and Unz Review. Anomaly does NOT challenge the alt-right in the article. Rather he focuses on anti-Semitism, no doubt because anti-Semitism is usually not something promoted by Quillette founder Claire Lehmann's old alt-right employer Ezra Levant. Except when Levant supported Gavin McInnes' anti-Jewish rant which I discussed here. But except for anti-Semitism (sometimes) and Trump, the Claire Lehmann strain of the alt-right is in agreement with every other strain of the alt-right. The White Citizens' Councils and the editors of Mankind Quarterly would be very proud indeed of people who fight against "equalitarianism" - people like Bo Winegard and Claire Lehmann and Jonny Anomaly.